Okay, so for the last day of this incarnation of fabric week, I thought I'd show something made up … I bought this fabric on eBay, I'm pretty sure, a decision based solely on that color green. I love that shade of green. 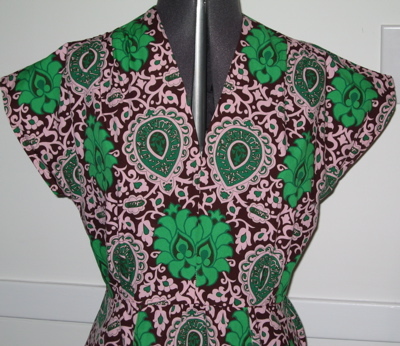 Of course, as with all fabric I bought in 2006, it was supposed to be part of a Duro dress. I could never find anything to match that raisin-y brown, though, and I thought matching the pink or the green would be too Lilly Pulitzer. So it sat in my fabric closet (which is not of Tardis-like proportions, despite rampant speculation in the comments, but is pretty darn close) for a while. Then I needed some fabric to "test" a new pattern — this is in fact the bodice from one pattern and the skirt from another; I'd show the images but I can't find them, arrgh — and thought of this stuff. The idea was the pattern would be SO BUSY that any bobbles in the construction wouldn't show. I love, love, love the fabric with the lines of that pattern. Beautiful! You did a great job. What kind of fabric is it? Rayon? Cotton? Silk? That is really adorable! Great print! Okay, now I want THAT fabric. Any more details on where it came from, besides E-Bay? Fabulous! I share your green-lust as well and with that raisin color – it’s drool-worthy. Any chance of you scrounging up the vintage pattern it (and the previous link) is based upon? Thanks for the daily eye candy! 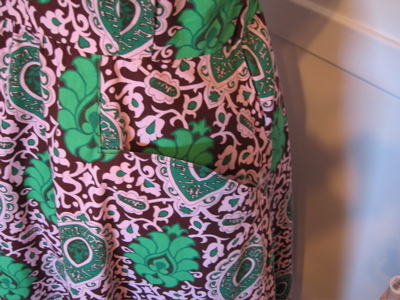 Love the fabric, and the pockets. Yay! Great job on aligning the print – esp the design in front of the shoulder seams, that looks very professional. Love the pockets as well. Wear it with pride! That’s so dang cute – and as if I didn’t already love your blog, now you’re making Dr Who references again. Hurray! i LOVE that fabric! it’s gorgeous! This dress is amazing! I love the fabric and green is my favorite color! Fantastic and very creative. I’m going to haunt your blog from now on! I love this dress so much. I wish I had the skill to make it! Very pretty. Love the pattern! Oh please, please, show us the skirt pattern–just gotta see those pockets? Are they inset into the side and waist seam? are the facings understitched? to prevent turnout?Love the fabric and pattern! Just beautiful! I love your blog, I’ve been reading it for over a year now. This dress really reminds me of the “day dress” from Trashy Diva. 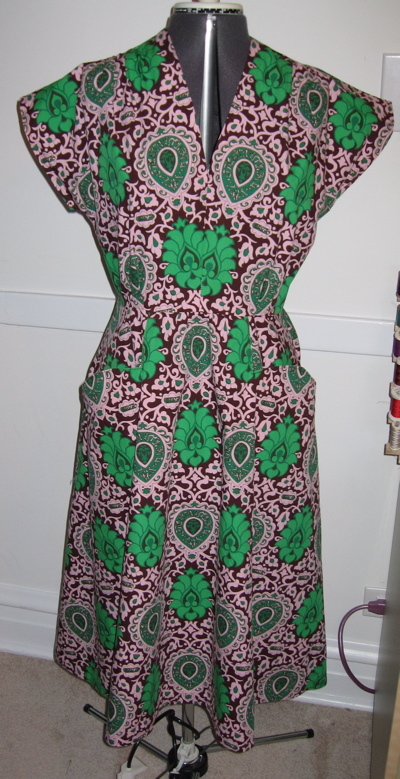 I just finished a wrap dress, and I cheated and topstitched the facings in place. M-C makes a good point about them being wider.Love, love, love this dress and fabric. Wear it someplace fun. Ok so I’ve never made anything that required the fabric details to line up (like you medallions or stripes or plaids) but I had a thought. With a large print like this could you trace that design element (your medallion) onto the pattern when you pin down the first piece (i.e. the right side front)and when you flip the pattern piece over to cut the left side front make sure to line it up with the outline on the pattern? Of course you’d have to cut the two pieces separately instead of at the same time like most directions instruct but it would be worth it if it worked. Thoughts? This is lovely indeed. The fabric the style, perfect. I’d wear it immediately, if I ever came across this kinda thing over here, which unfortunately is very unlikely. I love green! I truly like this dress. I love the pocket detail as well. This is an incredible dress! We all seem to love it. I bet you will get loads of compliments when you wear it. I love the curved pocket detail. It’s a pretty strong patterned dress. I am fairly quiet-featured and colored and I could never wear something so screaming loud: it’d look like the dress was wearing me! But I imagine it looks smashing on a different type. You, probably!